Telematics and big data are essential to any business that wants a better bottom line. But just having the data even if it is real time is not useful. That is why we deliver more actionable data to help you realize higher ROI and better fleet performance. Connected Vehicles uses Geotab technology so you can measure what matters. You can automate your back office, mileage, HOS, DVIR and IFTA reporting, etc. Geotab collects over 900 million points of data each day. Two thirds of these records are related to the engine data. Geotab’s team of of engineers and big data scientists have been working with engine data since 2004. We share this data with you to improve and transform your business – You operations become safer and more secure and predictable. 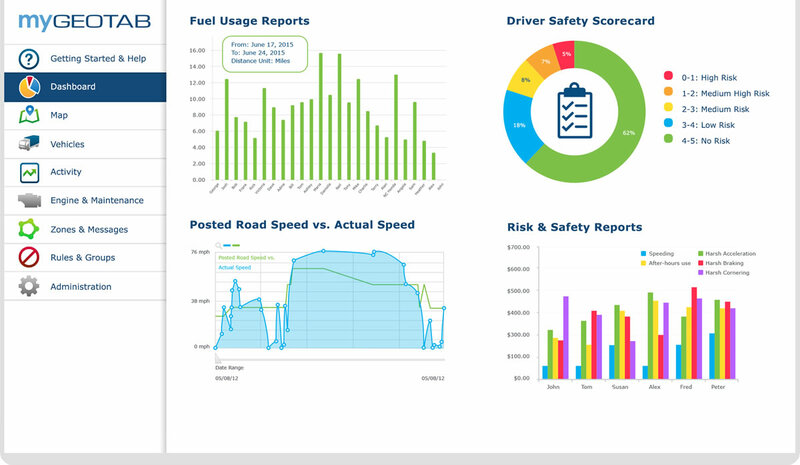 You will not only know where your vehicle locations and how they and your drivers are performing, you can also see trends such as driving habits, component wear and tear, fuel consumption, etc. This in turn will help you to predict your service and maintenance needs and help you reduce your downtime and lower your costs. Does the device provide actual odometer mileage, or only GPS mileage? How much of the relevant engine, fuel, and maintenance data is shared with you? Do they own and make the device or do they use a 3rd party device and firmware? Do they create the applications in-house or outsource? How secure is their data? Can they easily integrate 3rd party add-ons when you need them? Do you need to change expensive devices to accommodate your growing needs? Do they offer instant accident detection notifications and in-vehicle driver coaching? Can they trigger your internal systems when an accident is detected? Do they have the ability to recreate the accident if needed? Can they help you to quickly identify issues and prioritize repairs? Download this evaluation checklist from our partner Geotab and find out if your current telematics provider have what it takes to get your fleet moving into the future.